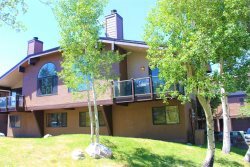 Mountain luxury and class in the heart of the June Lake Village. Your family will love this Victorian-style June Lake home that is complete with everything needed to have a magical stay in this charming mountain town. Enjoy the large front yard and outdoor fire pit, as well as a private back deck facing a meadow that is frequented by local mule deer. The interior of the home is comfortable but luxurious, with enough space for the whole family. With a large, upgraded kitchen and a huge master suite, you will feel right at home. This exquisite home is only available from June to October and is sure to be one of our most popular vacation experiences. In June Lake, we grow big and plentiful trophy trout. Start with Gull Lake or June Lake, both are just a short walk from the Village Victorian home, or fish down-canyon along Rush Creek, Silver Lake, Grant Lake. During the spring, summer, and fall, there are plenty of biking, boating, sightseeing, and hiking opportunities. After a short drive down-canyon, you will find the Rush Creek Trailhead from which you can hike to Agnew, Gem, and Waugh Lakes. The area surrounding June Lake offers so much to experience and places to explore, from Yosemite National Park and the Bodie ghost town to the many natural hot springs, or even just a sunset dinner at the Whoa Nellie Deli overlooking a serene Mono Lake. During autumn, when the leaves change, the June Lake area becomes alive with fall color - a photographers dream! Warm days and cool nights let you explore and hike the area in peace without the summer crowds. Upon arriving at the Village Victorian Home, you will be overwhelmed by its charm. Entering this lovely home, you will find the kitchen to your left and formal dining room to your right. The kitchen is a home cook's dream and includes a convenient dinette. From there, the living room with its large fireplace will beckon you in to with its cozy charm. On the first floor of the home, you will also have access to the garage, the laundry room, a full bathroom, and a bedroom with a queen-sized bed. Head upstairs to relax in the spacious master suite, which offers a king bed, fireplace, and sunny lounge area. Connected to the room is also a full bathroom with his and hers sinks, bathtub, and separate shower. In addition to the master suite upstairs, you will find two more comfortable, bright bedrooms, each with a queen-sized bed and plenty of storage space, as well as another full bathroom. This large, welcoming home has plenty of personal touches and is steeped in June Lake history - It truly feels like a family estate, not just another vacation rental!